The first real cold of the season has been working its way through the family, hitting me first then M and now Dave who has struggled into work today, saying he has things he needs to get finished. One of those things, is needing to submit his pumpkin for his employer's pumpkin carving competition. M and Dave spent yesterday morning hollowing out and carving pumpkins. 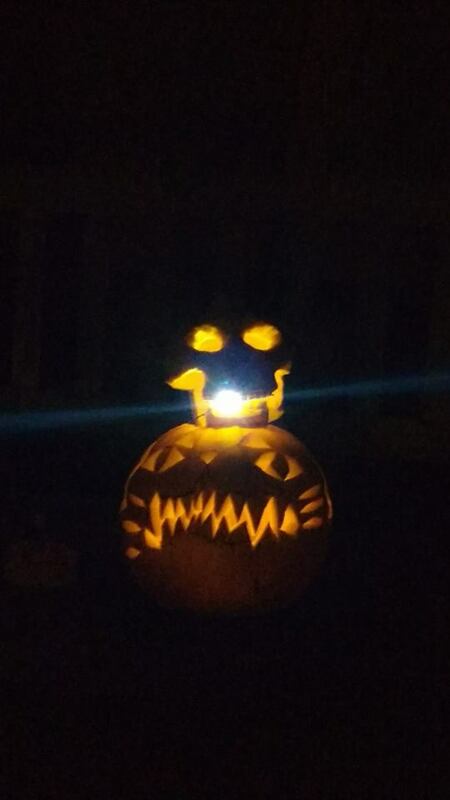 Dave went for a novel design, transforming his pumpkin into skull. M meanwhile was working on her allotment pumpkin, a fine specimen that she felt should be a tiger. M did all the scooping and drew her design, but Dave went in with the knife to make it come to life. Meanwhile I spent the day dividing my creative thinking between Hallowe'en and Inktober. The former required research, putting together some fun things for M to do over the next couple of days. There'd normally be a fair bit of seasonal baking at this point, but the oven chose to die on Friday night so no baking for us. Someone is organised to fix it at some point on Tuesday (i.e. Hallowe'en) but that isn't much help in terms of having an oven for some serious baking sessions. 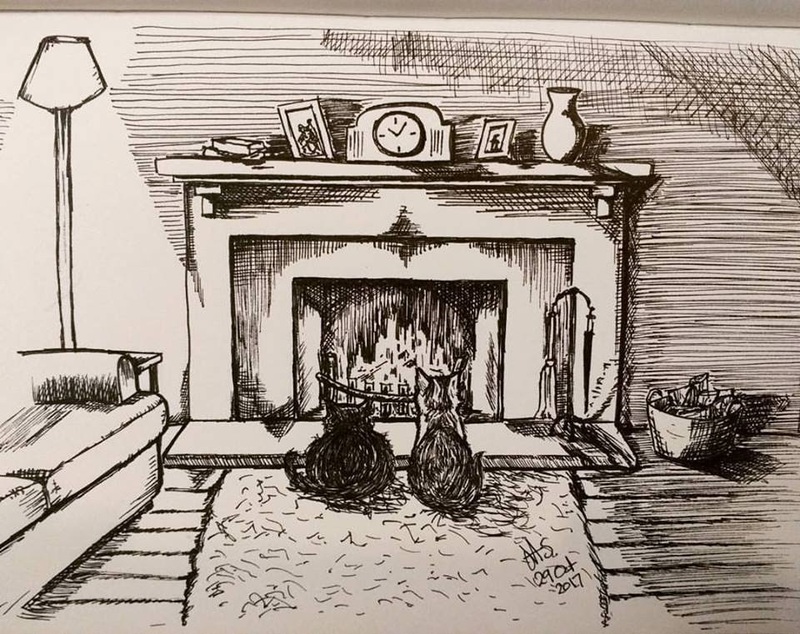 The Inktober prompt for yesterday was a difficult one - 'United'. I'll admit I was stumped and lacking in inspiration. My immediate association was 'football' (or 'soccer' if you're across the other side of the Atlantic) but that is so not me, it held no appeal whatsoever. Then there was 'tea and biscuits', but I couldn't be bothered to set up a suitable still life to use as a base. I could be terribly cliched and draw two hands holding each other, but I'm not into cliches. So I asked M, who said "Charlie and Missy", who are our cats. 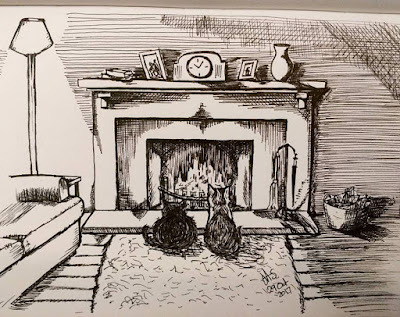 Once I had the suggestion, I was off and after a bit of thought, looking at pictures of fires in fireplaces to see what happens with the shadows, this is what I came up with.